Each archway is an interesting subject to study. Hatha and Pranayama are learned together. Raja yoga is yoga of the mind in which we learn about mantra, mudra and yantra. Jnana means knowledge, I have included a picture of the tree of life from the jewish mystics not a yogic tool but certainly perfectly correct in learning to dissolve the veils of ignorance and learn the many systems that have developed on this planet to reach enlightenment. 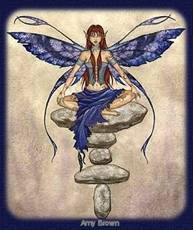 Charka’s are learned for self healing, moving the chi; and Kundalini is learned along with studying the Charka’s and Tantra. Tantra; the most liberating and fastest path to enlightenment but also the most dangerous path because if the ego is not properly trained, then all is lost. Love is the underlying current in all systems of yoga, magick, mysticism, religion and life. Without love we are mere animals lead by our ignorance self absorbed. Love opens the heart and allows true light to flow uplifting our spirits to ever heightened frequencies of being. "Let's tear down the wall that separates us from the Light, let aside our prejudices, rigidity, selfishness and ignorance...Let's try to learn to really live, to love and to be happy...Let's regain the candor and purity of our childhood, to be better, more altruist and wiser... Let us be on the same side of the Macrocosmic Harmony, to resonate with the energies of good, beauty and truth. Let's try to find the Ultimate Truth, to complete ourselves, to be springs of divine energy." In the valley of the River Indus, a team of archaeologists discovered the remains of a civilization. 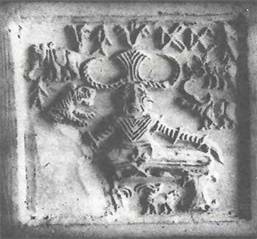 Amongst the valued artifacts discovered were a number of seals depicting horn-capped figures sitting in positions which are advanced Yogic postures. The most famous of these seals is that of an ithyphallic deity now recognized as Shiva. Yoga is a complete science of life that originated in India many thousands of years ago. It is the oldest system of personal development in the world, encompassing body, mind and spirit. The ancient yogis had a profound understanding of man’s essential nature and of what he needs to live in harmony with himself and his environment. They perceived the physical body as a vehicle, with the mind as the driver, the soul man’s true identity, and action, emotion and intelligence as the three forces which pull the body-vehicle. In order for there to be integrated development these three forces must be in balance. Taking into account the interrelationship between body and mind, they formulated a unique method for maintaining this balance – a method that combines all the movements you need for physical health with the breathing and meditation techniques that ensure peace of mind. The origins of yoga are shrouded in mists of time – for yoga is regarded as a divine science of life, revealed to enlightened sages in meditation. The oldest archaeological evidence of its existence is provided by a number of stone seals showing figures in yogic postures, excavated from the Indus valley and through to date from around 2000 BC. Yoga is first mentioned in the vast collection of scriptures called the Vedas, portions of which date from at least 2500 BC, but it is the Upanishads, which form the later part of the Vedas, that provide the main foundation of yoga teaching, and of the philosophy known as Vedanta. Central to Vedanta is the idea of one absolute reality or consciousness, known as Brahman that underlies the entire universe. Around the sixth century BC appeared two massive epic poems – the Ramayana, written by Valmiki, and the Mahabharata, written by Vyasa and containing the Bhagavad Gita, perhaps the best known of all yogic scriptures. In the Gita, God or Brahman, incarnated as Lord Krishna, instructs the warrior Arjuna in yoga - specifically in how to achieve liberation by fulfilling one’s duties in life. The backbone of Raja yoga is furnished by Patanjali’s Yoga Sutras, thought to have been written in the third century BC . The classical text on Hatha Yoga is the Hatha Yoga Pradipika, which describes the various asanas and breathing exercises which form the basis of the modern practice of yoga. Although many people think yoga refers to union between body and mind or body, mind and spirit, the traditional acceptance is union between the Jivatman and Paramatman that is between one's individual consciousness and the Universal Consciousness. The underlying purpose of all the different aspects of practice of yoga is to reunite the individual self (jiva), with the Absolute or pure consciousness (Brahman) – the word yoga means literally “joining”. Union with this unchanging reality liberates the spirit from all sense of separation, freeing it from the illusion of time, space and causation. It is only our own ignorance, our inability to discriminate between the real and unreal, that prevents us from realizing our true nature. In yoga teaching, reality is by definition unchanging and unmoving – the world, the manifest universe, which is in a perpetual state of flux is therefore illusion, or Maya. 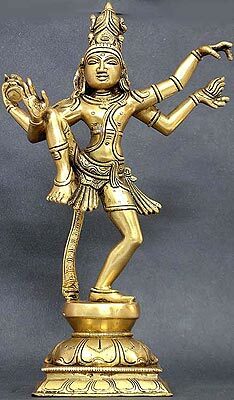 This is symbolized in the image of Siva, Lord of the Dance, depicted with his foot raised- when he puts his foot down, the universe as we know it will cease to exist. The manifest universe is only a superimposition on the real, it is projected on the screen of reality, much as a movie is projected on a screen at the cinema. Just as, walking in the dark, we may mistake a piece of rope for a snake, so without illumination we mistake the unreal for the real – we superimpose or project our own illusions on the real world. The illusory nature of temporal reality is reflected in the search of modern science for the ultimate, indivisible particle of matter. This has led to the realization that matter and energy are interchangeable, that the appearance of solidity we perceive in matter is created by movement or vibration – we see a moving fan as a whole circle. Most of what we perceive as solid is in fact empty space; if we were to take away all the space from all the atoms in our bodies, retaining only the “non-space”, we would not even by able to see what was left. In yoga philosophy, there was originally only the Self – undifferentiated energy, infinite, unchanging and formless. The process of differentiation which has led to the manifest universe, the physical world we know, is described in several different ways. First there was the Spirit, or Purusha; then came a great light (the big bang theory) which caused the evolution of the objective universe, as Prakriti, the manifest world we perceive. Once Prakriti moved out, the three qualities known as gunas were differentiated, where as in Purusha they were in equilibrium. 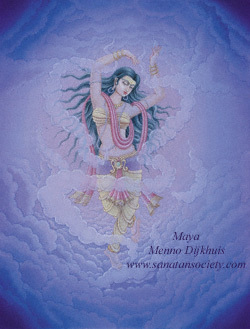 The same process is sometimes described as the differentiation of “I” and “this”, of subject and object, and mythologically as Shakti moving out from Siva – in the raising of kundalini, when the state of super consciousness is attained, the two principles are reunited and the illusion is no more. To a yogi, body and mind are part of the illusory world of matter, with a limited life span, but the spirit is eternal and passes on when one body wears out, to another. As the Bhagavad Gita says: “Just as a man casts off worn – out clothes and puts on new ones, so also the embodied Self casts off worn-out bodies and enters others which are new.” Through the cycle of reincarnation, we draw nearer to reuniting with the Self within, as the veil of ignorance grows thinner. Central to yogic thought is the law of Karma – of cause and effect, action and reaction. Every action and thought bear fruit whether in this life or in future lives. We reap what we sow, molding our future by what we do and think in the present. Different schools teach different paths. All the paths lead ultimately to the same destination - to union with Brahman or God – and the lessons of each of them need to be integrated if true wisdom is to be attained. Karma yoga – is the path of service – It purifies the heart by teaching you to act selflessly, without thought of gain or reward. By detaching yourself from the fruits of your actions and offering them up to God, you learn to sublimate the ego. To achieve this, it is helpful to keep your mind focused by repeating a mantra while engaged in any activity. The principle of karma yoga is that what we experience today is created by our actions in the past. Therefore, all of our present efforts become a way to consciously create a future that frees us from being bound by negativity and selfishness. Bhakti Yoga - is the path of devotion, yoga of the heart. ‘The Bhakti yogi is motivated chiefly by the power of love and sees God as the embodiment of love. Through prayer, worship and ritual the devotee surrenders them self to god, channeling and transmuting their emotions into unconditional love or devotion. Chanting or singing the praises of God form a substantial part of Bhakti Yoga. Jnana Yoga – the path of knowledge or wisdom – is the most difficult path, requiring tremendous strength of will and intellect. Taking the philosophy of Vedanta the Jnana yogi uses his mind to inquire into its own nature. We perceive the space inside and outside a glass as different, just as we see ourselves as separate from God. Jnana Yoga leads the devotee to experience his unity with God directly by breaking the glass, dissolving the veils of ignorance. Before practicing Jnana Yoga, the aspirant needs to have integrated the lessons of the other yogic paths – for without selflessness and love of God, strength of body and mind, the search for self-realization can become mere idle speculation. This path requires development of the intellect through the study of the scriptures and texts of the yogic tradition. Raja Yoga – is the science of physical and mental control. Often called the "royal road" it offers a comprehensive method for controlling the waves of thought by turning our mental and physical energy into spiritual energy. Raja Yoga is also called Ahtanga Yoga referring to the eight limbs leading to absolute mental control. The chief practice of Raja Yoga is meditation. It also includes all other methods which help one to control body, energy, senses and mind. The Hatha-Yogi uses Relaxation and other practices such as Yamas, Niyamas, Mudras, Bandhas etc.. to gain control of the physical body and the subtle life force called Prana. When body and energy are under control meditation comes naturally. The practice of raja yoga typically starts with hatha yoga, which gives the body the needed health and strength to endure the more advanced stages of training. Mantra’s are spiritual conduits, words or vibrations that instill one-pointed concentration in the devotee. A Mudra is a hand or finger gesture that aids the practitioner in their focused meditation. 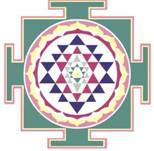 Yantra - Yantra is a symbolic image used to maintain a focused state during meditation. 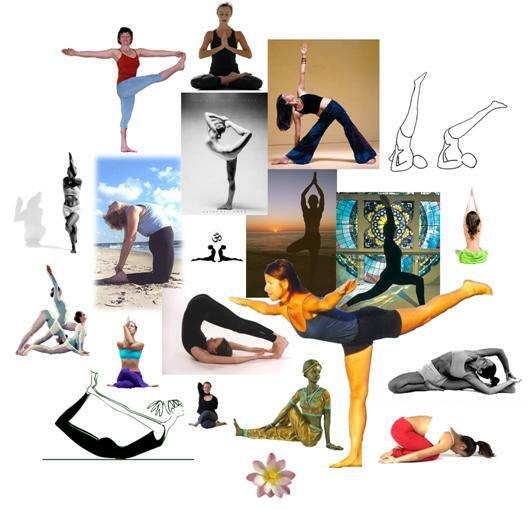 Hatha Yoga - Called the "forcef ul path" this is the yoga of physical well-being. In the modern Western approach, hatha yoga is used primarily as a form of physical therapy. It consists of asanas (postures), pranayamas (breathing exercises), and meditation. Chakra yoga - The Chakras are the seven main energy centers in the body. They are located along the Spine, starting at the base and running upwards to the crown of the head. The Chakras are described as "whirling disks of light", and each Chakra radiates a specific color and energy. As each Chakra relates to specific spiritual, emotional, psychological and physical issues, the conscious awareness and the balancing of these energy centers lead to well-being. Kundalini - Kundalini in Sanskrit literally means either "coiled up" or "coiling like a snake." Kundalini experiences are understood using the structure of the chakra system, the psycho-spiritual energy centers along the spine. Kundalini rises from the root chakra up through the spinal channel, (called Shushumna), and it is believed to activate each chakra it goes through. When Kundalini Shakti unites itself with the Supreme Being (Lord Shiva), the aspirant gets engrossed in deep meditation during which he perceives infinite bliss. 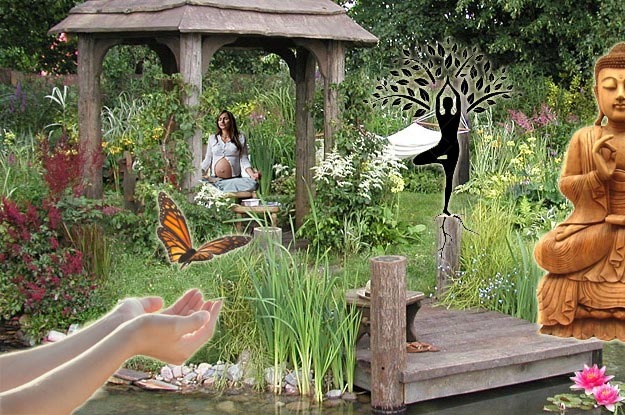 In raising Kundalini, spiritual powers (siddhis) are also believed to arise. Transpersonal literature notes that kundalini rising is not without dangers. If we take this into consideration it is best to be guided by an accredited teacher, or unless one has undergone thorough psychological preparation and education in the chosen meditation-practice. 1. Yamas - The Yamas or restraints (Don'ts) are divided into five moral injunctions, aimed at destroying the lower nature. They should all be practiced and developed by the letter but also more importantly in the spirit. They should all be practiced in word, thought and deed. § Brahmacharya - moderation in all things (control of all senses). § Saucha - purity - this internal and external cleanliness. 5. Pratyahara - withdrawal of the senses in order to still the mind. 8. Samadhi - the superconscious state. In Samadhi non-duality or oneness is experienced. This is the deepest and highest state of consciousness where body and mind have been transcended and the Yogi is one with the Self or God. Meditation, like sleep, cannot be taught – it comes by itself, in its own time. But if you follow the right steps to begin with, you can speed up your progress considerably. To help people to understand the basic steps and stages of meditation, Swami Vishnu formulated the Twelve Principles, summarized below. The most essential thing is to establish meditation as a regular habit in your life, using the same place and time each day. This will train the mind to respond without delay once you sit down to meditate – much as your stomach is conditioned to expect food at mealtimes. After a few months of regular practice, your mind will begin to demand this quiet time of its own accord. The most favorable time of day for meditation are at dawn and at dusk, when the atmosphere is charged with spiritual energy. But if neither of these times is possible, simply choose a time when you can be alone and undisturbed. Start by practicing for twenty minutes, and gradually increase the time to an hour. Sit facing the East or North to benefit from the subtle effects of the earth’s magnetic field. You may want to wrap a blanket around yourself before you start so as to keep warm. It is most important that you’re sitting position is steady and relaxed, as your concentration will be disturbed if you are uncomfortable. Before beginning, instruct your mind to be silent and to forget all thoughts. Now regulate your breathing – this will control the flow of prana which in turn will help to still the mind. You should not attempt to combat the restlessness of your mind, as this will only generate more thought waves. Simply detach yourself from your thoughts and watch your mind. 1. Set aside a special place for meditation – the atmosphere you build up will help still the mind. 2. Choose a time when your mind is free of everyday concerns – dawn and dusk are ideal. 3. Using the same time and place each day conditions the mind to slow down more quickly. 4. Sit with your back, neck and head in a straight line, facing North or East. 5. Instruct your mind to remain quiet for the duration of your meditation session. 6. Regulate your breathing – start with five minutes’ deep breathing then slow it down. 7. Establish a rhythmic breathing pattern – inhaling then exhaling for about three seconds. 8. At first, let your mind wander – it will only grow more restless if you force it to concentrate. 9. Now bring the mind to rest on the focal point of your choice – either the Ajna or the /Anahata chakra. 10. Applying your chosen technique, hold your object of concentration at his focal point throughout your session. 11. Meditation comes when you reach a state of pure thought, but still retain your awareness of duality. 12. After long practice, duality disappears and samadhi, the superconscious state is attained. Sound is a form of energy made up of vibrations or wavelengths – center wave lengths have the power to heal, others are capable of shattering glass. Mantras are Sanskrit syllables, words or phrases which, when repeated in meditation, will bring the individual to a higher state of consciousness. They are sounds or energies that have always existed in the universe and can neither be created nor destroyed. There are six qualities common to any true mantra: it was originally revealed to and handed on by a sage who attained self-realization through it; it has a certain metre and a presiding deity; it has a “bija” or seed at its essence which invests it with special power; it has divine cosmic energy or shakti; and lastly it has a key which must be unlocked through constant repetition before pure consciousness is revealed. Japa or mantra repetition not only provides you with a tangible point on which to focus your mind – it also releases the energy encased in that sound. The energy literally manifests itself, creating a specific thought pattern in the mind. Correct pronunciation is therefore very important. With sincere practice, repetition of a mantra leads to pure thought where the sound vibration merges with the thought vibration and there is no awareness of meaning. In this way the mantra will lead you to true meditation, to a state of oneness, of non duality. It is best to be initiated into a mantra by a guru, who will invest it with his own pranic energy. But if this is not possible, practice repeating the mantras and choose one that feels comfortable. Bija mantras are too powerful to be used by beginners. You can repeat your mantra out loud – by saying or chanting it - in a whisper, or mentally. Mental japa is the most effective, because mantras are on a wavelength far beyond “voiced” or physical sound. But at the beginning, when keeping the mind focused is more of a problem, you should start your meditation by voicing the mantra, and then whisper it, before turning to mental repetition. Whichever form of japa you use, it is helpful to coordinate the mantra with your breathing. You can use a string of beads called a “mala” repeating your mantra as you count along the beads. Or can write the mantra down at the same time as repeating it mentally. A mala has one hundred and eight beads plus the larger “meru” bead. Holding it in the right hand, start at the meru and roll the beads along one by one between your thumb and third fingers while repeating your mantra. When you reach the meru, roll the mala in the opposite direction. Don’t cross over the meru bead. Om (Ohm) Om is the original mantra, the root of all sounds and letters. The “O” is generated deep within the body, and slowly brought upward joining the “m” which then resonates through the entire head. Repeating Om for twenty minutes relaxes every atom in your body. § Prana - "life force" or "life energy"
§ Yama - "discipline" or "control"
§ Ayama - "expansion", "non-restraint", or "extension"
Yoga breathing or pranayama revitalizes the body, steadies the emotions and creates great clarity of mind. Before practicing the exercises, you should be sure that you understand how to breathe correctly, making full use of the diaphragm. In order to facilitate the flow of prana and ensure that there is space for expansion of the lungs, yoga breathing exercise are performed sitting down with the spine, neck and head in a straight line. Take two normal breaths. Inhale. Now exhale, pulling in your abdomen. Repeat twenty times, keeping a steady rhythm and emphasizing the exhalation each time. Then inhale, exhale completely, inhale fully and hold your breath for as long as you comfortably can. Slowly exhale. is also called the Alternate Nostril Breathing Technique. In this Breathing Technique, you inhale through one nostril, retain the breath, and exhale through the other nostril in a ratio of 2:8:4. 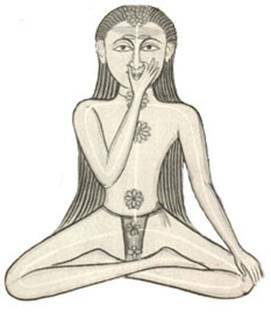 The left nostril is the path of the Nadi called Ida and the right nostril is the path of the Nadi called Pingala. If you are really healthy, you will breathe predominantly through the Ida nostril about one hour and fifty minutes, then through the Pingala nostril. But in many people, this natural rhythm is disturbed. Anuloma Viloma restores, equalizes and balances the flow of Prana in the body. One round of Anuloma Viloma is made up of six steps. Start by practicing three rounds and build up slowly to twenty rounds, extending the count within the given ratio. Mudras start electromagnetic currents within the body which balance and restore health. JUPITER MUDRA: (below right). With the the two index fingers together, the power of Jupiter, or good luck and expansion is activated. Together they focus your energy to break through barriers. A yantra is meditational device used in Hindu and Tibetan Tantric meditation. From the root "yam," meaning "to sustain," the Yantra is a symbolic image used to maintain a focused state during meditation. A yantra is usually composed of an outer geometrical form enclosing an interiorgeometrical designs. Each particular design is used for a specific purpose or intent. Asana is one of the eight limbs of classical Yoga, which states that asana should be steady and comfortable, firm yet relaxed. Asana is defined as "posture;" its literal meaning is "seat." Originally, the asanas served as stable postures for prolonged meditation. More than just stretching, asanas open the energy channels, chakras and psychic centers of the body. Asanas purify and strengthen the body and control and focus the mind. When holding a yoga posture, make sure you can breathe slowly and deeply, using Dirga or Ujjiayi Pranayama. Go to your edge in the posture, holding where you feel a good stretch and/or your body working, but don’t feel pain, strain or fatigue. Self examination only in an atmosphere of complete honesty can unconsciousness psychic impediments to our growth be cleared away. When we turn our consciousness inward to reflect upon the self, a new sensitivity unfolds. Meditation is a very effective method of relaxation. The idea of meditation is to focus your thoughts on one relaxing thing for a sustained period of time. This rests your mind by diverting it from thinking about the problems that have caused stress. It gives your body time to relax and recuperate and clear away toxins that may have built up through stress and mental or physical activity. Meditation slows breathing, reduces blood pressure, helps muscles relax, gives the body time to eliminate lactic acid and other waste products, reduces anxiety, eliminates stressful thoughts, helps with clear thinking, helps with focus and concentration, reduces irritability, and reduces stress headaches. The study of pranayama helps one control their breathing, which in turns helps one control their emotional and mental states. By simply focusing the attention on the breath alone helps one to relax. Start by diaphragm breathing place one hand on the belly the other the chest. As you breath in stretch the belly out as far as you can, then watch the chest rise, watch you are not drawing the shoulders up, the shoulders must be still and relaxed to get a full inhale. Hole the breath for a short spell, as is comfortable, then exhale slowly, make the out breath longer then the in breath. You can count, in 1,2,3,4, hold 1,2,3,4, out 1,2,3,4,5 hold, 1,2,3,4 or as is comfortable for you, finding your rhythm and expanding the number as you are able. Alternatively you could visualizing health and relaxation flowing into your body when you inhale, and stress or pain flowing out when you exhale, relaxing all muscles as you exhale gives a nice release to help in relaxing. This exercise is especially beneficial before doing hatha yoga. Some people like to focus on sounds. Singing puts one in a rhythmical space to lure oneself into a calming mood. Different songs fit different moods. Certain mantra’s help along with dancing, moving the whole body to a rhythm helps relax and release tension putting the mind and emotions into a pleasant space. This can be a very refreshing and pleasant way of meditating. Here you create a mental image of a pleasant and relaxing place in your mind. Involve all your senses in the imagery: see the place, hear the sounds, smell the aromas, feel the temperature and the movement of the wind. Enjoy the location in your mind. 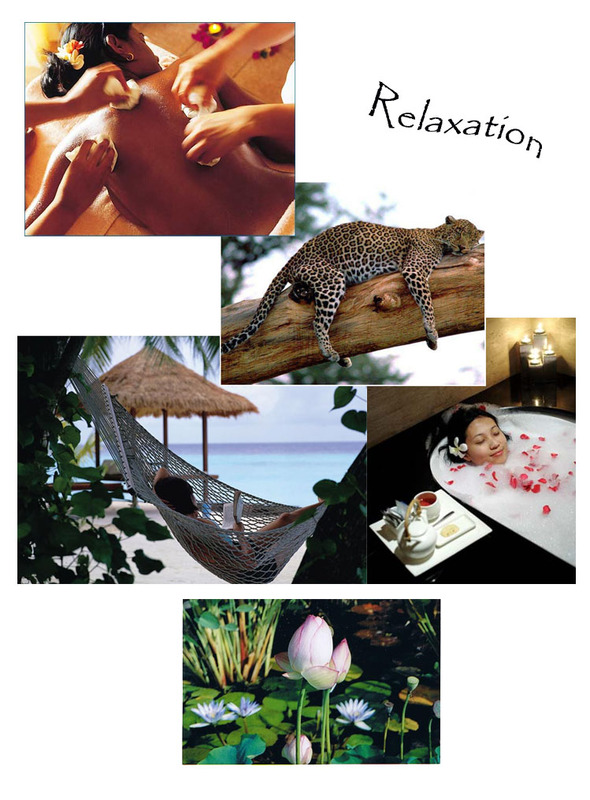 Feel yourself rejuvenate as you allow yourself to experience deep inner relaxation and peace. 2 ways one is to tighten every muscle in your body, arms, legs, belly, buttocks, shoulders, face….. take a big in breath and hold for 5 seconds then release. Feel yourself letting go of all your tensions. Just enjoy that feeling for a minute, as your muscles let go more and more. The other way is to lie down and starting with the toes on the inhale tense them on the out release the tension. Slowly make your way up your body tensing each muscle area on the inhale and releasing on the out. Then so as the paragraph before, tense all your muscles together and release. Practicing hatha yoga helps keep the body flexible and manageable, along with any exercise, such as dancing or swimming etc, moving the body keeps the muscles in check from freezing up and opening the passage way for easy movement. The chakras are energy centers in the etheric body which have been described as looking like flowers or whirlpools to clairvoyant sight. The name chakra, means "wheel" ..
Function: Gives vitality to the physical body. Life force, self-preservation, instincts. Qualities & Lessons: Matters relating to the material world, success. Mastery of the physical body. Grounding, individuality, stability, security, stillness, health, courage, patience. Functions: Procreation, assimilation of foods, physical force and vitality, sexuality. Qualities & Lessons: Giving and receiving, strong emotions, desire, pleasure seeking, sexual/passionate love, change, movement, assimilation of new ideas. Good health, tolerance, surrender. Working harmoniously and creatively with others. Functions: Vitalizes the sympathetic nervous system, digestive processes, metabolism and emotions. Qualities & Lessons: Will, personal power, authority, energy, mastery of desires, self-control. Radiance, warmth, awakening, transformation, humor and laughter. Gems/minerals: Citrine, gold topaz, amber, tiger eye, yellow sapphire, gold. Functions: Anchors the life force from the higher self. Energizes the blood and physical body with the life force (breath) and regulates blood circulation. Qualities & Lessons: Divine, unconditional love. Forgiveness, compassion, understanding, balance, group consciousness, oneness with life. Acceptance, peace, openness, harmony and contentment. Gems/minerals: Emerald, green and pink tourmaline, malachite, green jade, green aventurine, chrysoprase, kunzite, rose quartz, ruby. Qualities & Lessons: Power of the spoken word. True communication. Creative expression in speech, writing and the arts. Integration, peace, truth, knowledge, wisdom, loyalty, honesty, reliability, gentleness and kindness. Gems/minerals: Turquoise, chrysocolla, celestite, blue topaz, sodalite, lapis lazuli, aquamarine, azurite, kyanite. Location: Center of the forehead, between the eyebrows. Functions: Vitalizes the lower brain and central nervous system. Regulates vision. Qualities & Lessons: Soul realization, intuition, insight, imagination. Clairvoyance, concentration, peace of mind. Wisdom, devotion, perception beyond duality. Qualities & Lessons: Unification of the higher self with the human personality. Oneness with the infinite. Spiritual will, inspiration, unity, wisdom and understanding. Idealism, selfless service. Perception beyond space and time. Continuity of consciousness. Gems/minerals: Amethyst, alexandrite, diamond, sugilite, purple fluorite, clear quartz, selenite.